We have a full line sword accessories that consist of sword hangers, sword display stands, sword plaques and sword care products. We have three styles of sword hanger that consist of regular sword hangers, Denix sword hangers and Oriental style sword hangers. Sword hangers are the minimum amount of hardware to hang a sword on the wall. We have three styles of display stands that hold your sword on a rack, on a table, dresser or even on the floor. We have regular sword display stands, Denix sword stand and Oriental style sword stands. Whether you're looking for a simple traditional style sword plaque or something unique with a fantasy flair, you will find the perfect sword plaque to display your prized sword. Finally we have sword care products or maintenance products. Sword care products consists of kits, waxes, oils and polishes to keep your sword in great condition and that will make it last for years to come. Looking for something than the regular old and traditional sword stands and sword hangers? 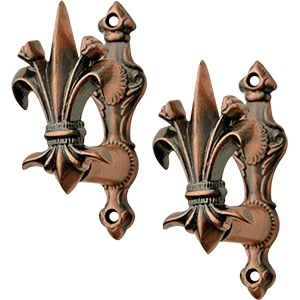 We carry medieval and fantasy styled sword plaques and sword holders. These sword plaques and sword holders are made of cast poly resin or wood. 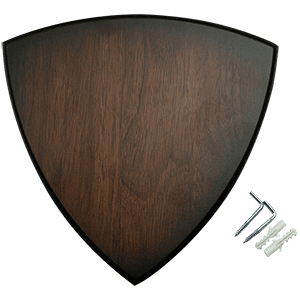 We carry griffin sword plaques, dragon sword plaques, eagle sword plaques and plain universal sword plaques. Universal sword plaques feature metal hanging hooks that can be adjusted to fit almost any sword, using the pre-drilled holes on the back. Swords shown in these sword plaques are not included unless otherwise specified. These medieval sword plaques will make your medieval sword stand out on your wall in your home or office. We have display stands that can display from one sword up to thirteen swords. We have table stands, floor stands, wall stands and wall racks to display your sword collection. Our sword stands will turn your sword collection clutter to an exquisite focal point in the room. We have sunburst sword stands for multiple swords to be displayed together and single sword stands. 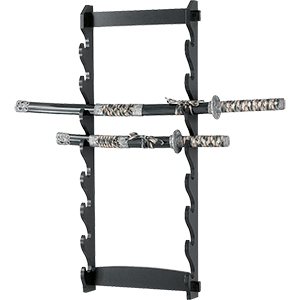 These sword stands are made of wood and have either a black lacquer finish or a wooden finish. Our sword stands are made of sturdy construction, so you can rest assure that your medieval swords will not fall on the floor. You can turn any room in your home into a Museum with these quality sword stands. We have all your sword care and maintenance products for your medieval sword or collection. These maintenance and care products include sword maintenance kits, sword wax, sword oil, sword polish and rustblocker. Maintaining and caring for your sword is essential to keep your sword from rusting and deteriorating. Rust on a sword, is a priority once it has appeared on your sword. Rust is like a weed because it spreads fast once it gets started. To prevent rust from starting on your sword, our wax and sword oil will help. We want your sword to last a life time because it is an investment.